Inheriting a home is both a blessing and a curse. On one hand, something very valuable was passed down to you. On the other hand, so was all of the responsibility that comes along with being a homeowner. If you already have your hands full with your own home and your career, it’s easy to feel surprised and overwhelmed. Whether you keep it or sell it, you’re now the owner of a home. This means all of the taxes are your responsibility. If you’ve never inherited anything before, you’re probably in over your head. Even if you know how to manage your regular taxes without blinking an eye, the taxes you’ll face in this situation are quite different. Different doesn’t have to mean difficult, so if you know where you stand and what you have to deal with, you’ll be able to jump start the process efficiently. How you handle your taxes depends on what you intend to do with the home. For example, living in the home is very straightforward. Living in it for a little while and then selling it changes the process. Never living in it and only selling it is a process of its own, and simply inheriting it is an entirely unique situation. Estate taxes essentially handle themselves, though not all estates will be taxed. Any estate valued at over one million dollars has taxes deducted right from estate. This means the cash value is taken out and transferred as the tax, leaving the estate at a smaller sum. California doesn’t add any extra estate taxes. For inheritance taxes, things work a little differently. How much you pay (if you’ll even have to pay) is weighed against an annual number set by the IRS. They’ll set an exemption amount, and you have to pit your figures against their figure. You’re able to deduct things like mortgages that weren’t paid in full. As long as the full sum is less than the exemption amount (which is usually above one million dollars) you don’t have to worry about paying an inheritance tax. As soon as you obtain ownership of the property, you’re responsible for the taxes. This may seem frightening if the property has gone up in value, but you don’t need to worry – provided you inherited the house from your parents. 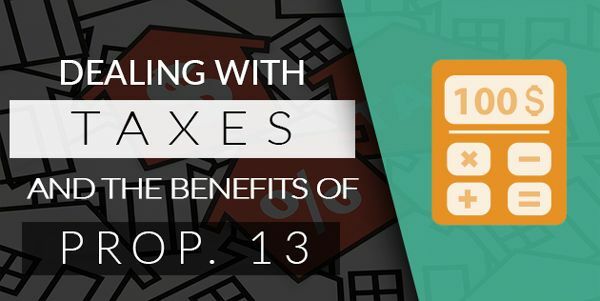 Proposition 13 has you covered, and your tax rates won’t be any higher than what your parents were paying. This means that your property taxes are low, and they’re going to stay low. If you choose to keep or rent the house, the taxes will stay manageable. When you inherit the house, you inherit the tax rate as long as you fall under the exclusion. Built into Proposition 13 is something called a “parent-child reassessment exclusion”. It prevents the property from being reassessed for its tax rate, as long as the child of the original owner takes ownership. The house may have increased in value since the original assessment – and sometimes that increase will be overwhelmingly large. Don’t even worry about it. Property values are high in Southern California. If you want to keep this house and it belonged to your parents, you’ll be able to afford it. You won’t be priced out by a reassessment. If you’re considering keeping the property, you don’t have to worry about exorbitant tax rates becoming an obstacle. The taxes you pay are going to be much higher if the person you inherited from wasn’t your parent. If this is the case, you’re best off selling the property immediately if you don’t plan on selling your current residence and moving into the new one. You only have to worry about capital gains taxes when you sell a property you’ve inherited. If the house you’ve inherited was purchased a long time ago, it’s probably seen a significant increase in value. This won’t affect you. If you sell the house right away at its current value, it’s a direct exchange. When you have a $400,000 property, and you sell it for $400,000, that’s considered breaking even in the eyes of the capital gains tax. If you sit on the property for a while, including living in it or renting it out, it may gain value. Then, you’re only responsible for the difference between the value of the home when you first received it and the amount you sold it for. When a $400,000 house becomes a $425,000 house, you’re only responsible for paying the gains tax on the $25,000 difference. Capital gains never come from the original purchase price on a home you’ve inherited, because that simply wasn’t what it was worth when it became yours. In rare cases, the property may have decreased in value over the years. Since the ownership was transferred to you, if you sell it for less than the price it was initially worth, you may be able to claim the sale of the property as a tax loss. You should only handle taxes on your own if you feel like you understand them well enough. Though taxes on an inherited home are some of the simplest you’ll deal with, you don’t necessarily have to deal with them on your own. When in doubt, you can always contact a tax professional and have them review all of your information. There’s nothing wrong with soliciting the advice of someone whose career is dedicated to handling situations like yours.